Andover Twp is proud to announce that the Mayor and Town Committee have passed a resolution to begin an Andover CERT in our community. CERT stands for Community Emergency Response Team, and it is a chance for you, as Andover residents, to make an impact on your town, and to become more self-sufficient. As a CERT member you can provide backup, assistance and support to our First Responders, and learn to be confident in an emergency or disaster within our community. You will receive 21 hours of FREE disaster preparedness training. This program is overseen by our OEM Coordinator, Chief of Police Eric Danielson. Linda Grinthal will be assembling and leading the team. Pick up an application form at the municipal building, or contact Linda at 973-579-7382 text or phone, or LSG2@PTD.net. Click here for press release. Click here for CERT application. Click here to read article in the NJ Herald. Lake Lenape Water Company Customers: Please use the following hotline number to report any complaints regarding your water service. NJDEP: Complaint & Enforcement Hotline 1-877-927-6337. After you contacted the NJDEP Hotline please email the Municipal Clerk dfrancisco@andovertwp.org with the complaint reference number given to you by the Hotline and a brief summary of the reason for your call. This will help the township officials track complaints by our residents. A FREE app is available for Andover Township residents that can assist them with recycling and trash information, collection schedules, and more. 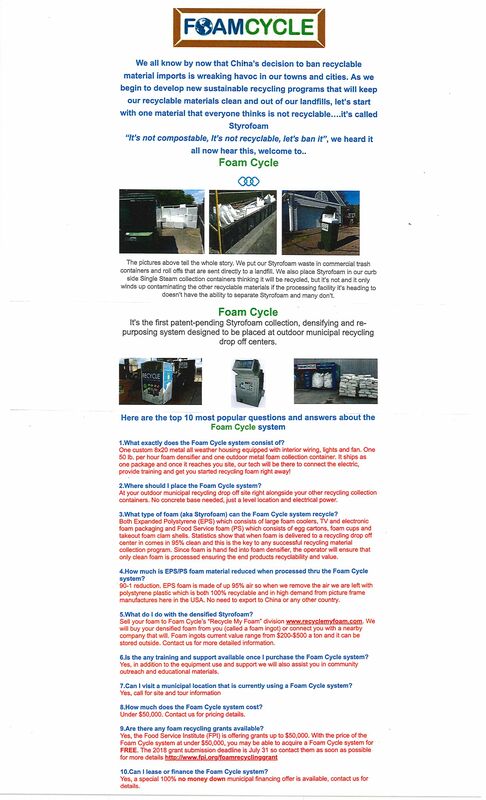 The Recycle Coach application provides information in a clear and concise manner. Click here for the press release. Click here to go to our RecycleCoach page. The provider for the Reverse 911 system has changed from CodeRed to Swift911. Previously submitted phone and/or contact information to receive reverse 911s' will not transfer over from vendor to vendor. Therefore it will be necessary to register your cell phones, emails, or even your landline phones if it is Voice over Internet Protocol (VOIP). Even if you have a landline phone through Verizon or Centurylink it is suggested to register. With storm restoration efforts continuing to progress, Jersey Central Power & Light (JCP&L) reminds customers that they need to be aware that individual outages to their homes may require an electrician and inspection before service can be restored. For information that helps explain what equipment customers may need an electrician to address before restoration can be completed, click here. Renew your dog's license by January 31st. Click here to download information on what you can do to help protect our water. PLEASE BE ADVISED: Any pool that holds 24 inches of water or greater requires zoning and construction permits, even blow-up pools and temporary pools. Pools require both a building and an electrical permit. The electrical installation to a pool is unique in the electrical code and a whole chapter is dedicated to the wiring. Pools also require a barrier, which is a minimum of 48 inches in height, with access to the pool through a self-closing/self-latching gate. Everything associated with the barrier around a pool is regulated. Please check with the construction department before purchase of your pool if you have any questions. Any resident with an open pool permit must have final inspections from the town before using the pool. Pools that are in use without final inspection will be subject to violations and penalties. The Andover Township Fire Department’s Junior Auxiliary sells blue reflective address signs. The signs are 6 x 18 inches and can easily be mounted to your house or mailbox. The signs are $15. Contact Bob Reidmiller at 973-579-2694.
WHO: School aged children and adults who live in Sussex County. WHERE: Sussex County Public Health Nursing Office, 201 Wheatsworth Rd, Hardyston, NJ. For services available download flier. FREE RECYCLING PROGRAMS - TerraCycle recently launched several new recycling programs including the Tide Eco-Box Recycling Program and eos Recycling Program. Keep an eye out for new recycling programs launching each month for more ways to reduce your environmental impact. Planet Aid Recycling Options Recycling in the household doesn't only mean cans, bottles, and paper. Many items can be repurposed and spared from the landfill with just a little extra effort. Click here for recycling options. Click here for the Planet Aid Blog.